Here in Southeast Asia humans and elephants have been working side-by-side for 4000 years, even depended on each other for survival - similar to the way horses were integral to life in many Western countries. Elephants rescued hundreds of people during WW1. Elephants plowed rice fields in the remote Karen hill tribe villages where there were no roads. Elephants helped build Ankor Wat. 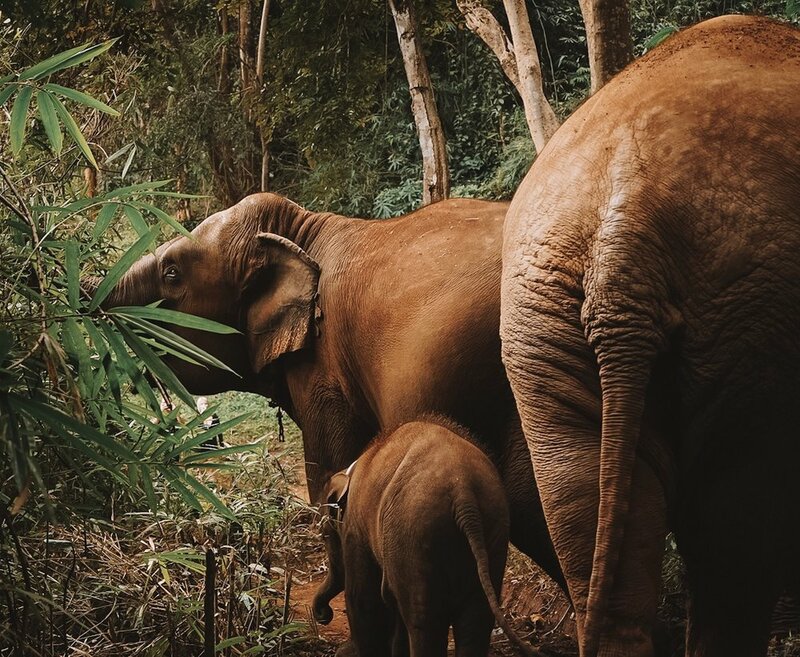 In the past, Thailand’s forests teemed with a vast wild population estimated at the beginning of the 20th century to be in excess of 300,000, with a further 100,000 domesticated elephants. Presently in Northern Thailand there are no wild elephants - because there is simply no habitat left for them. Over the course of the last century, elephants’ natural habitat was taken over by “civilization”: villages and cities chopped up the jungle with roads and sold swathes of it off to make room for industrial agriculture. In reality, palm oil is a much bigger threat to elephants than tourism. Keep an open mind and you can learn more. Most people have emotional response to the domestication of Thai elephants but it’s good to also have an informed one. Chains, for instance, are often presented as unethical. But skillfully used chains actually benefit elephants. The mahout cannot be with his elephant 24 hours a day, so when he is resting, the elephant is chained. Without large expensive enclosures, chains are the only measure of protection to ensure the safety of both humans and elephants. Otherwise, elephants attack each other, get hit by cars, electrocuted by fences, injure or kill humans and destroy crops in neighboring farms. At night, elephants are tethered with long chains of up to 20-30 meters, enabling them to be regularly moved to new natural food sources and to graze within a large circle defined by the length of the chain. Additionally, metal chains are the best tether for an elephant, as it does not chafe their skin like nylon or cotton rope. And with regards to training, I soon realised that without teaching an elephant to understand certain commands, vital veterinary care is impossible. These elephants are now trained with positive re-enforcement at the Thai Elephant Conservation Center. TECC uses Target Training and employs very skilled trainers who have been pioneering a non-invasive method of training and improving it year after year. They teach all mahouts to carry a kaw, or a bull hook, in order to keep themselves, other humans and other elephants safe. Elephants are still huge animals and can be very dangerous at times: the mahouts are tasked with saving human and elephant lives. But there is a huge difference between carrying a bull hook for safety and using it to train an animal through negative reinforcement. To be clear - Chai Lai Orchid is not a “sanctuary”. The term “sanctuary” is often misused by captive elephant facilities, in an effort to differentiate them from other places with alternative management styles. At present, no tourism-funded ASEAN elephant facility meets all the requirements that define a true sanctuary. But I do think of this place as a haven. I did think about trying to buy elephants to rescue them from abusive owners, but experts explained that buying elephants financially rewards owners and provides the lump sum to buy new elephants which are then trafficked from the wild. So instead we rent the elephants here, to keep the heavy metal chairs off their backs and make their lives as pleasant as possible. By developing positive communication with the camp owner, we have encouraged him to vastly improve his practices. It’s not perfect. It’s an ongoing process. We believe though that in this way we can show camp owners they can still make a profit while treating the elephants humanely. If successful, I think many elephant camps will adopt our model and improve the lives of more elephants - in fact, we have already seen that happening at the camps up and down our valley. My hope for the future is that Thailand’s large domesticated elephant population can be used to maintain genetic diversity and help the survival of wild elephants in Thailand. If managed carefully, the tourist industry can ensure that large numbers of elephants will remain cared for and protected for the foreseeable future. Thank you so much for supporting us and our dream for the elephants. CAN ELEPHANTS IN ASIA BE FREED INTO THE WILD? Should we BOYCOTT ELEPHANT CAMPS? One of the reasons elephant population has declined so drastically in the last 20 years is because elephants and mahouts could no longer earn a living. Mahouts couldn’t afford to care for and feed their charges, which resulted in street begging elephants and illegal, amphetamine-addicted logging elephants. We don't want to go backward. Through ethical elephant tourism, owners can provide a home and stable income for both the elephants and the Mahouts. Lack of land, human-elephant conflict and poaching make it very dangerous for elephants to be in the wild. Even elephants in conservation centers and sanctuaries are not completely free. With all of these problems, it is important to create the most humane environments possible for the captive elephants to live in so that they are protected and do not become extinct. CAN ELEPHANT TOURISM HELP ELEPHANTS? Work can actually be stimulating for elephants, and studies have shown that working elephants live longer than those in zoos. We create a unique experience where guests can learn about elephants while interacting, playing, feeding and bathing them. These are all stimulating but low-stress activities for the elephants. For domestic elephants, our friends aren’t doing too badly. They are the offspring of domesticated Thai elephants — not wild ones from Burma. The youngest were all conceived and born here which both promotes elephant conservation and indicates that they are comfortable and healthy. These elephants have elephant friends, a clean river to play and bathe in every day, a lush bamboo forest to sleep in, and Mahouts who love them. Tourism is also important in that it’s a big factor in governmental decisions to take strong measures to protect elephants because it is vital to their economies. Domesticated elephants play a valuable part in education and as ambassador animals on behalf of their wild cousins. We hope that after seeing these beautiful animals up close, meeting and learning about them, and watching them interact in a loving and protective family group, you will leave a friend of the elephants for life. DOES RIDING AN ELEPHANT Help or HURT IT? There has been a lot of misinformation online about Elephants anatomy and their spines. That depends on how it's done. For Asian female elephant cows, the average weight is about 3 tons (6,000 pounds) so you are maybe 2.5% of her weight. So simply sitting on her back doesn't hurt her. In fact, scientific studies have shown elephants in camps that offer rides to be less stressed than in observation only camps. However, chairs and saddles can hurt an elephant if there are any stones or debris beneath the padding or if the padding is too thin. Additionally, if the chairs are on the elephant all day they can cause sores, and for the elephant to overheat. The chairs and padding need to stay dry so the elephant can't swim in the river to cool down. See how riding an elephant can improve their heath care here. Does Chai Lai buy or Sell elephants? No. Because we care about wild elephant conservation too. When you buy an elephant from an abusive situation you reward the owner with money (about 60,000 USD ) to buy new elephants and traffic them from the wild. We rent elephants in order to break this cycle. Do the elephants have chains? Yes, elephant caretakers have them on hand but doesn't mean they use them. Mahout are responsible for protecting lives of elephants as well as our guests and their children. If an elephant attacks a person or elephant. All mahouts are equipped with a bullhook in order to try to control the elephant in emergency and life threating situations. It is intended as a tool to keep people and elephants safe. How should I behave around elephants? Elephants are smart and gentle but also wild animals and extremely strong. Do not sneak up behind them, tease them, make loud noises or sudden movements around them. They have a blind spot directly in front of them, try to stand to the side so they can see you well. The mahouts have been trained to control the elephants and ensure everyone's safety, so please listen to them around the elephants. And lastly, do not approach a young elephant with hour her mahout, as this can be stressful for them if they don't know you can have a trusted caretaker near by.